1.) Wrap Rescue Tape around project by stretching and overlapping onto itself. Stretch at least double to ensure a good bond; for high pressure leaks stretch to maximum amount. The tighter Rescue Tape is wrapped, the quicker and stronger the bond. 2.) Continue wrapping Rescue Tape around project by overlapping 50% onto itself so that ½ the width is covered with the next wrap. The first and last wrap should completely overlap onto the previous wrap for a complete bond. Additional layers may be necessary, and the same process should be used over the previous layers. Rescue Tape works on either side. 3.) Repositioning Rescue Tape is only appropriate in the first few seconds after wrapping. Attempting to reposition Rescue Tape after 1 minute or longer is not recommended. 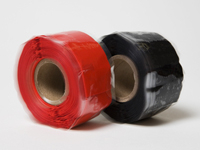 Rescue Tape is not reusable; however, additional Rescue Tape can be applied over project at any time in the future. For high pressure leaks, additional wrapping may be required. Most hose repairs can be repaired with 3-5 layers in thickness, and wrapping 3 to 5 inches in each direction away from the leak; however, additional strength can be added simply by wrapping more Rescue Tape. Rescue Tape has essentially a "maximum" stretch. It is important to stretch Rescue Tape to its maximum to avoid having the leak create a bubble. This product is provided without warranty, either expressed or implied, of fitness for a specific purpose. Because conditions and methods of use are beyond the manufacturer’s control, neither manufacturer nor seller will assume any responsibility for the use or misuse of this product. This includes, but is not limited to, any consequential damages.